It’s not unusual to see John Entholt out running on the roadsides in New York and Vermont. He’s mastered marathons, ultramarathons and even a 100-mile race. This winter, he traded in his running shoes for hiking boots with cleats. “With running, you’re just looking where your foot is going to fall and that’s it,” Entholt said, noting that hiking adds a different perspective. 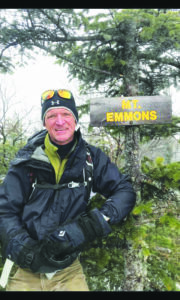 Truthville-born Entholt climbed all 46 of the Adirondacks’ high peaks this winter. Although he grew up just miles from the Adirondacks, Entholt hadn’t spent too much time there. After hiking his first high peak, 5,344-foot Mt. Marcy, on Dec. 9, Entholt was hooked. “I just fell in love with the area,” he said.